The thing which really set Lou Reed apart from the other stars he was grouped with in the Seventies (including David Bowie, Iggy Pop and so on) is that he never once considered pandering to his audience – he always made them work for their enjoyment of his music. It could be said that making them work was the one consistent thread which held every single solitary album in his catalogue together actually; he did it right up until the day he died in 2013 (as Lulu, the album that the singer made with Metallica proves, effortlessly). That wasn’t always met positively by fans or critics (the singer was called “moody,” “arrogant,” “frustrating” and “evasive” as a matter of course in many album reviews), but it did make not just for a fantastic set of stories about the singer, it made for a phenomenal discography too. Reed was an outsider, and that made for a stunning and inimitable body of work – a fact which is put into great relief on this box set which collects the first fourteen solo studio albums that Reed released as well as the singer’s epic Rock n’ Roll Animal live album. All told, that works out to seventeen CDs and, given the work ethic that a few of those albums require to make it through the set in its entirety, it’s unlikely that anyone could go the distance all at once – but it’s still a fantastic experience, regardless of how many days it may take listeners who begin the journey. Following Transformer, Berlin (which, again, Rolling Stone labelled “a disaster” in 1973 before ranking it number 344 on their list of the 500 greatest albums of all time) would begin the trend of Reed following his muse unquestioningly and above all else. That trend would be exemplified by Metal Machine Music (which came just two years after Berlin was released), the album which really threw audiences for a loop in its day. Composed of mixed, oscillating feedback, one has to wonder if the intention wasn’t to take a shot at critics for all of their comments to that point in the singer’s career because it really WAS earsplitting – and still is, even in the carefully remixed and remastered permutation presented here. The sonic textures of Metal Machine Music remain unbelievably caustic even now, forty-one years after its original release, but the remarkable thing about it is just how influential MMM has proven to be; looking through the years, it could be contended that the use of feedback which proved to be so key in the development of the American underground, alternative rock and the music of bands like Sonic Youth, Nirvana and Pavement (to name only the simplest examples) owe a spectacular debt to this album which was considered such a collossal flop upon its release. Without it, so many ideas may never have been developed or persued and, because of that, Metal Machine Music now finds itself a far more welcome home because it helped to expand pop’s sonic palette dynamically. Granted, there are still moments in its running which are downright earsplitting, but there’s simply no way to ignore the influence the sound has exerted. Venturing deeper still into this box set, listeners will find great experiences as well as challenging ones and potential points of discussion through albums like Street Hustle (which both does and does not at all feel raw thanks to the binaural recording technique employed to capture the sound), Growing Up In Public (which examines a malaise beyond that of Reed’s baseline level, as proven by songs like “How Do You Speak To An Angel?,” “My Old Man,” the title track and “The Power of Positive Drinking”), The Blue Mask (which, again, gives several hints at alt-rock dynamics and developments about a decade early), Legendary Hearts (which remains this critic’s least favorite Reed album due to its generally sterile tone as well as the sound of the bass guitar) and New Sensations (Lou Reed’s closest to a new wave album – which is much better than that description implies) before finally closing out at the singer’s final album for RCA, Mistrial (which continues to feel bittersweet). As listeners pick their way through and absorb each of what these albums has to offer, they’ll discover that, while all sound like they were the work of the same artist, they don’t sound the same; through this box, they’ll come to realize that Lou Reed never comfortably rested anywhere and always had more inspiration in the well. After having finally gone front-to-back with this box set (it took this writer four days) listeners will find themselves heaving exhausted sighs – whether they intended to or not. 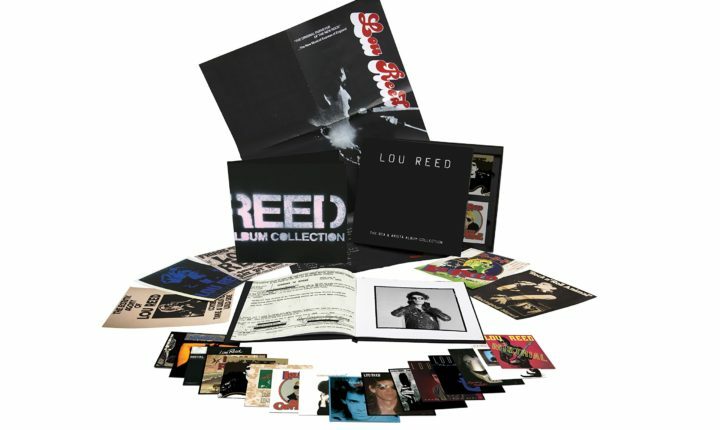 While they won’t deny that the remixed, remastered and refreshed expressions of each of these records is impressive (this was the final undertaking that Lou Reed began before his passing – he personally oversaw every aspect of this box set), they may not necessarily be able to say that each album is gold. That isn’t the point though; by collecting these albums together and presenting them all in succession, those who begin the experience will be given a great sense of the creative drive which compelled Lou Reed to make each album included as well as seeing the growth and development that Lou Reed underwent along the way. Atfter they realize that, listeners will realize just how candid The RCA & Arista Album Collection is, and relish in the knowledge imparted by it. The RCA & Arista Album Collection is out now. Buy it here on Amazon.